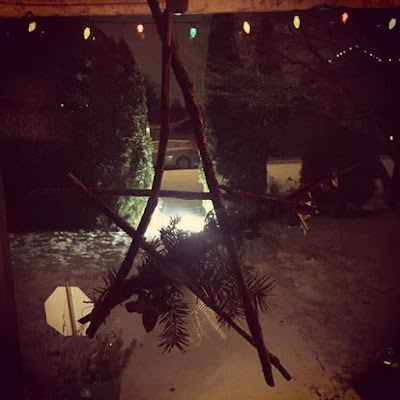 December 26th and we survived Christmas again. 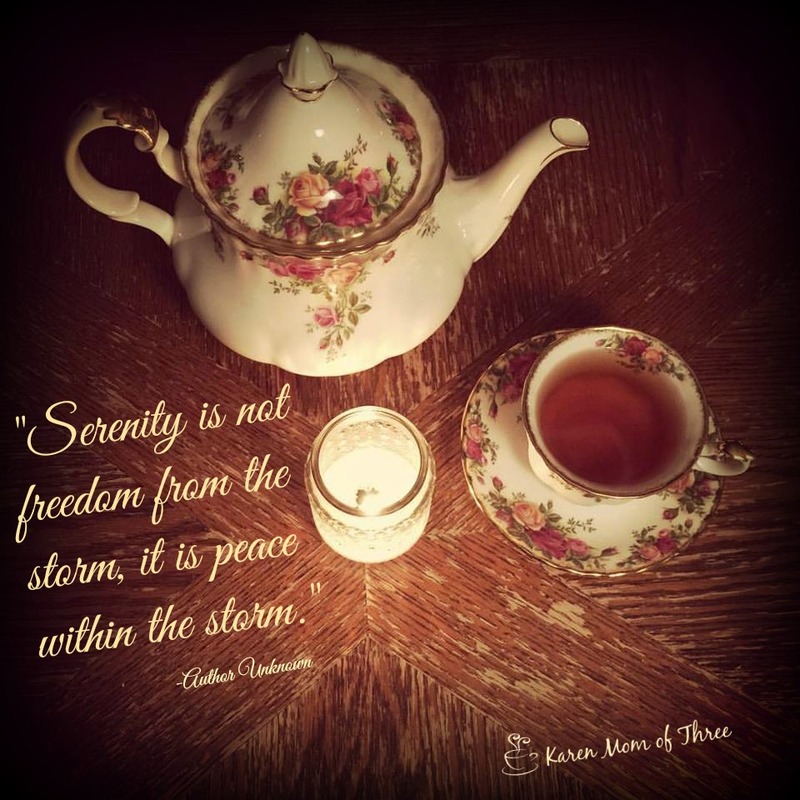 Normally a "happy stressful time", it is however under lots of stress and activity, lack of internet, wifi and routine that is at the top of my troubles along with the move which is hours away that I find myself a bit out of sorts this morning. Vancouver has woken up again to snow. It is debilitating on a city who doesn't get regular snow, to have this much in such a small window of time. As I made toast and tea for what will be the second to last time in this house, I look around to see how much still needs to be done before this move. When I look around the new place and see how many boxes we have moved I have the same feeling though slightly lighter at the thought. I know there are far worse things in life then moving. I know there is true suffering and misery in the world and I am grateful for all that I have and all that I am getting, however this morning is bittersweet. I don't like not being able to write and post daily, I feel like my right arm has been cut off with out the access to the internet we all take for granted. 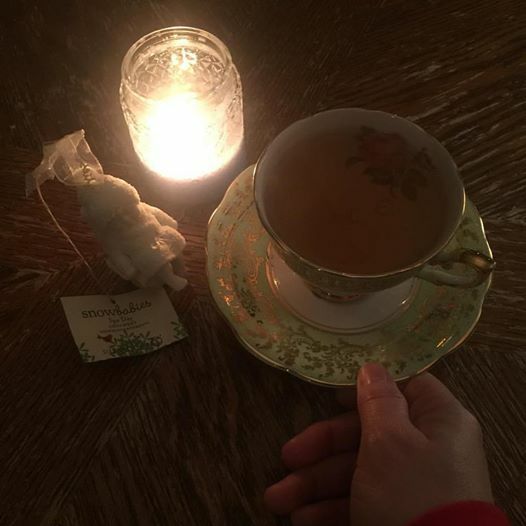 I look forward to sitting and reading, writing and sharing more when I get into the new house, until then I will do my very best to share something here daily so you know I am alive and well, blessedly stressed. I hope you have all had a lovely Christmas, or are enjoying Hannukkah or even just your Monday. Merry Christmas to you and yours from my family to yours. Today I am sharing my Grandmother Gibson's Chocolate Czechoslovakian Cookies. They are a thumbprint cookies my dad, sisters and I love. In a mixing bowl add your margarine and sugar, beat together and add vanilla. Add your coco powder and then flour, work this mixture with your hands and roll small balls. Place on cookie sheet and use your thumb to press the centers in. Bake for 10 mins at 325, remove from the oven and re-dent the center. 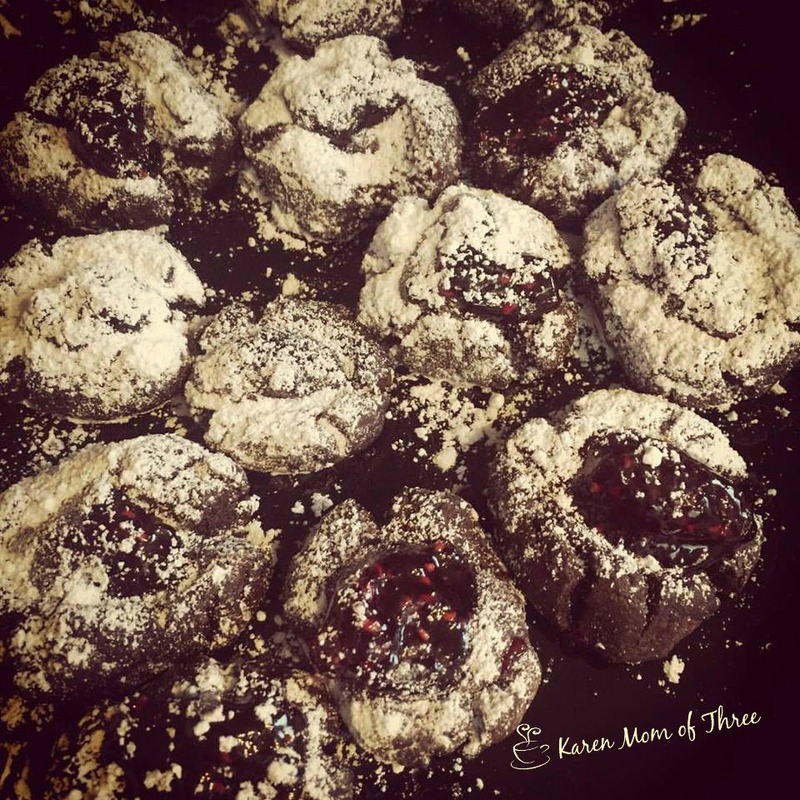 Add a tsp of jam in the center and use a small strainer to sprinkle icing sugar over the cookies while they cool on the tray. Serve with your favorite tea or store in an air tight container. Merry Christmas Eve from my table to yours, what a week this has been, a snow storm, no internet and the move just two days away things are out of control crazy but I have gotten some fun new titles for 2017 and some great reading done! 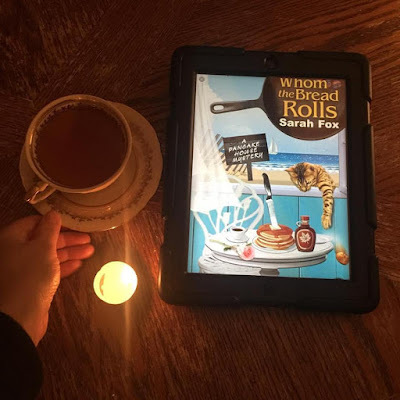 I was lucky enough to get an advanced reading copy of Sarah Fox's For Whom The Bread Rolls. A great second in series that you will want to read when the tulips start bursting up from the ground. Reading this mid March release about the sweltering Summer heat was a delight this cold and damp pas week. Murder Go Round by Carol J. Perry is a great story! I love the Russian Royal Family history and this one is so well done! Out in January you wont want to miss this one! 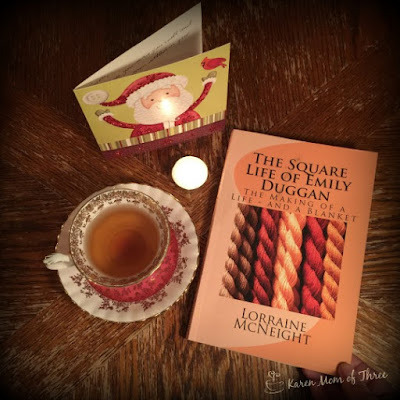 A lovely surprise to have The Square Life of Emily Duggan on my table this week written by a neighbor this was a lovely look at someones life, cozy and reflective, could not help but cry. Vicki Delany has me very excited about this new series and the first title is appropriately named Elementary, She Read ! Another mid March release this one is sure to get you thinking! Delightful! My friend Anna makes the best shortbread. 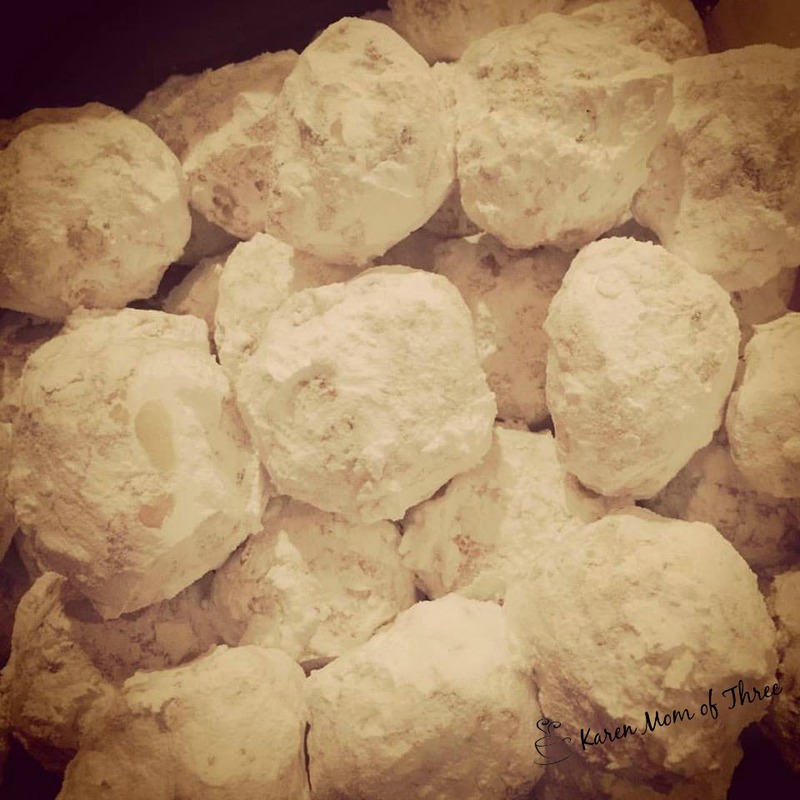 These lovely almost fist sized Russian tea cakes were a delightful surprise this week, seeing that I ate all the ones from the cookie exchange a few weeks ago. 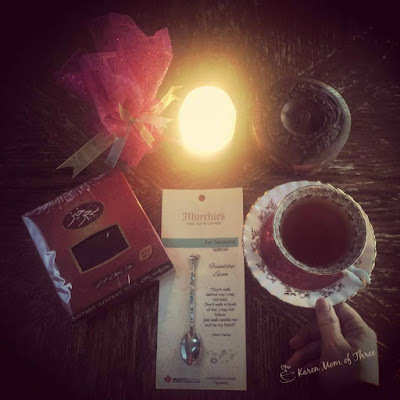 These are great with the Murchies Vanilla tea that has sustained me this week. I have no wifi at the moment and am writing from my in laws, the snow storm has caused damage to our internet and cable and the soonest they can come fix it is the day after we move out, so I am writing you on the fly. This time of year I want to do nothing and yet I am running like a chicken with my head cut off but If I could crochet and had no where to go I would be at home creating a cozy blanket like the one that alwaysrooney.com made. 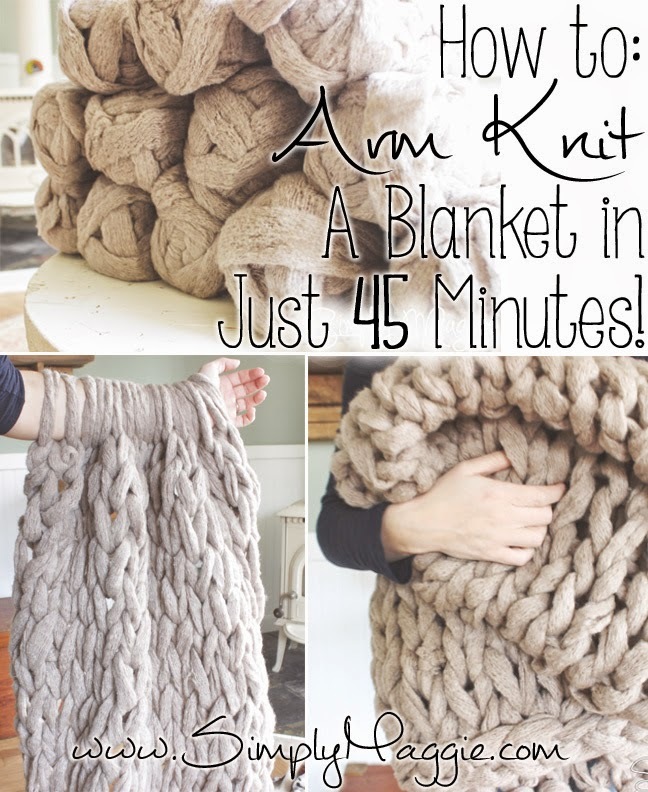 This one took 13 skeins of yarn and is clearly an investment as much as a labor of love but if you check out her website you will agree this looks amazing! 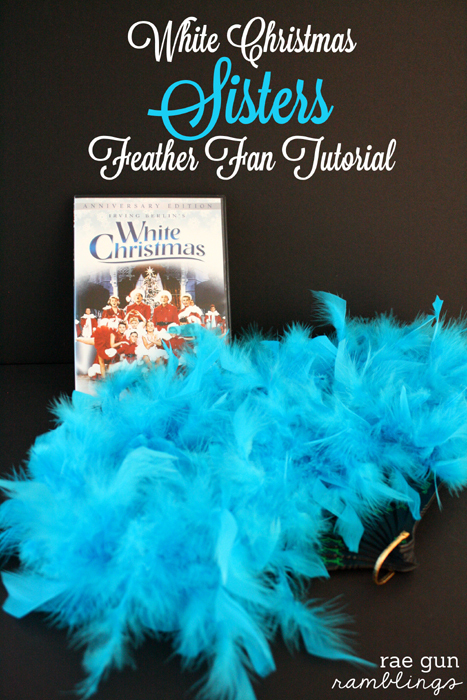 Click here for her tutorial. 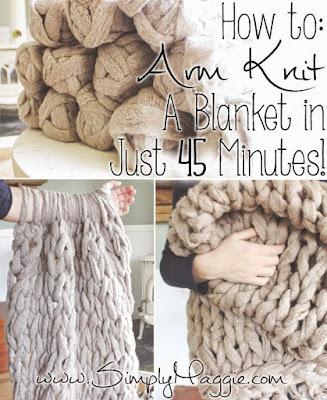 I do know how to knit and I would love to knit a chunky blanket like this one, these are lovely and the cost of the yarn has held me back but one of these days I am going to give this a try! www.simplymaggie.com has a great tutorial and I am sharing it with you so maybe we can make it together one day! Perhaps we need a retreat! Well I am back to packing boxes and cleaning the dreaded blinds. I hope you have a wonderful rest of the day and I look forward to sharing more with you tomorrow. Please forgive my unedited photos today as I am having issues with our internet, the company providing our coverage can not have someone out to our house until after we move. The recent snow has caused a problem to the feed coming into our house. I am hopeful that this review will even post. I read the March 14th Release, For Whom the Bread Rolls by Sarah Fox last night. 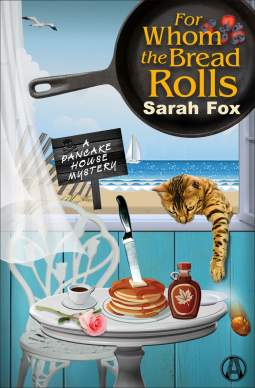 This is the second in the west coast based Pancake House Mystery series. Book two starts off a few weeks after main character Marley permanently relocates to run her inherited Pancake house. Plagued by troubles from Ida, the town trouble maker, Marley becomes a suspect when she finds Ida dead. Trying to clear her own name Marley is dealing with untrusting locals, her feelings about love and loss and so much more. Book two is a good summer themed beach read and one you are sure to enjoy! Tourist season’s in full swing in the small seaside town of Wildwood Cove, and Marley McKinney couldn’t be happier. Since taking over the Flip Side restaurant, she’s made a few close friends, adopted a cat named Flapjack, and started dating her childhood crush. 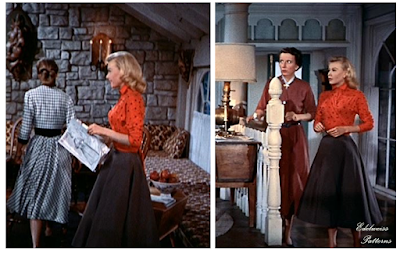 The only cloud on the horizon is local nuisance Ida Winkler, who blames Marley for landing her nephew in prison. Trying to get a rise out of Marley, Ida’s been making crank calls and even vandalizing the pancake house.The police can’t do much about the pranks, so Marley sets out to bury the hatchet once and for all. But someone’s beat her to it—in the most shocking way possible. After stumbling across Ida’s dead body, Marley’s suddenly the number-one suspect in her murder. Clearing her good name is going to be a tall order, but Marley’s not about to let Ida keep ruining her life—especially from beyond the grave. 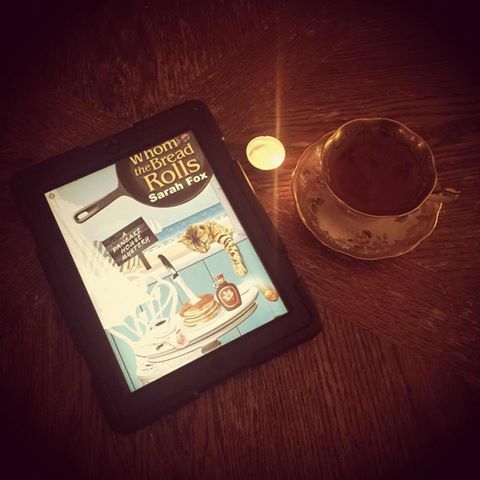 To order your own copy of For Whom The Bread Rolls by Sarah Fox on Amazon please click here. 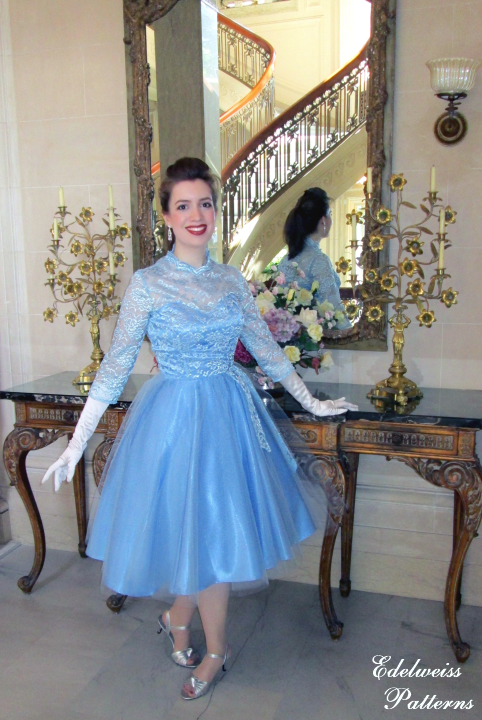 To learn more about Sarah Fox please click here. January has some exciting releases for you and this is one I was so excited for. I love Carol J. Perry's Witch City Mysteries and it was such a pleasure to read Murder Go Round this last night. Carol writes one of my most favorite characters, Lee is a wonderful character. She is in her 30's a Nascar Widow and has a touch of paranormal visions that help her unwillingly solve murders in Salem MA. She lives with her aunt in a beautiful home and is starting to come into her own as a teacher as well as a student. This was a fun Russian themed mystery. I love books about the Romanov Dynasty and this was a well planned mystery based on Russian crafts people who were sent to America before the revolution to be in place should the family need to flee. I enjoyed this plausible mystery and theories of long lost treasure seemly hidden in plan sight all these years later. If you have not yet discovered this series this is a good one!I love the covers on these cozies and Book 4 is fantastic but Book 1 still holds my heart! Be sure to order and be one of the first people to read this January 31st release. Lee Barrett has agreed to attend a storage auction with Aunt Ibby—even though she suspects the forgotten rooms will yield more junk than treasure. 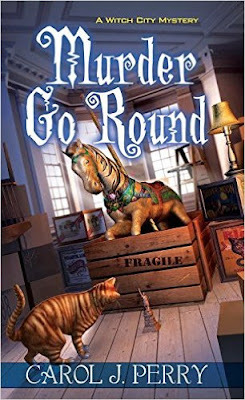 Her skepticism vanishes once the two win a bid on an overlooked locker and uncover a trove of beautiful curiosities, including a stunning wooden carousel horse with gentle eyes and fading paint. But just before Lee leaves the fairground relic at a local repair shop, the sight of a silver samovar awakens her psychic abilities and conjures visions of murder.Lee prays the intrusive ESP episode was just a glimpse into the past—until her policeman boyfriend reports a dead man outside the repair shop. Apparently, the unknown victim had been hot on Lee’s trail since the auction. And with the horse found dismantled, it looks like he was up to no good. What’s the story behind the antique equine, and could a strange bubblegum-chewing woman with fiery hair have something to do with the crime? Guided by her gift and O’Ryan, her wise tabby cat, Lee’s set on catching the murderer . . . before she’s sent on the darkest ride of her life. 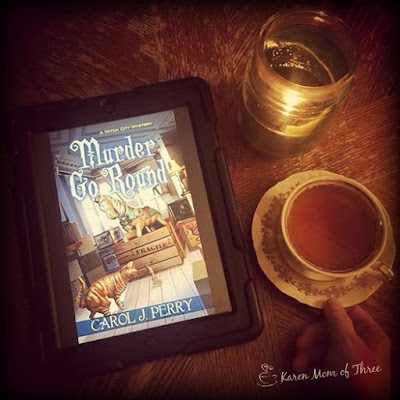 To order you own copy of Murder Go Round by Carol J. Perry from Amazon please click here. Learn more about Carol J. Perry click here for her website. 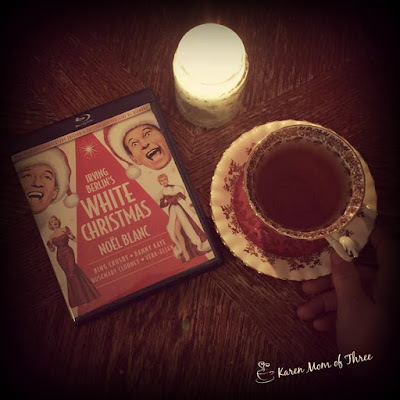 I love the "Sisters" Number and found this fun inspired craft by craftingchicks.com and thought I would share the link here if you like me think this would be a fun idea to make for a White Christmas Themed Tea! 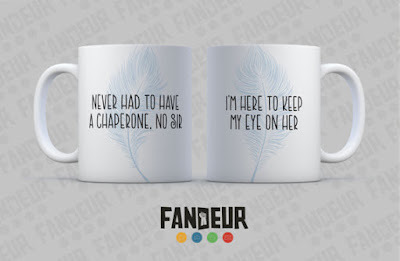 As I am a tad obsessed with the movie, I went on Etsy to see what I could find, I found these mugs! Oh my I do believe I must add these to my wish list! 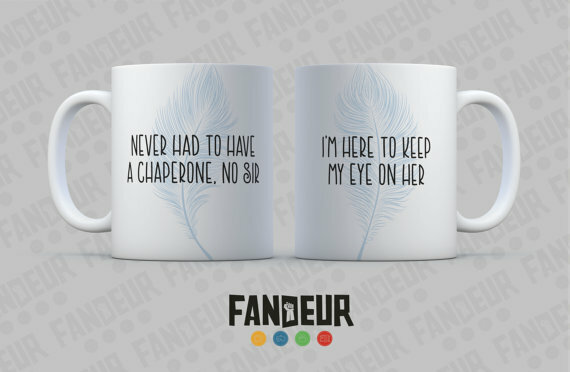 From Fandeur they are made to order and priced at $24.00! Click here for the link. 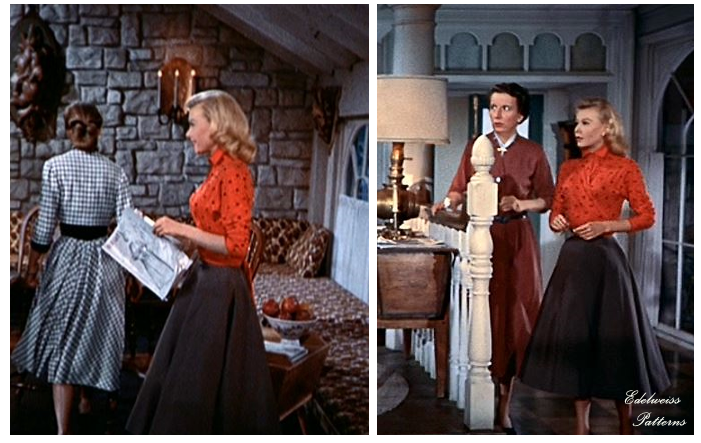 for a wrapped top and flared skirt. Click here for the link. I was inspired by what I saw on the Edelweisspatterns.com and how amazing hers turned out. I wonder if I could really sew something like this for myself! Oh I may have a new goal once the boxes are unpacked! 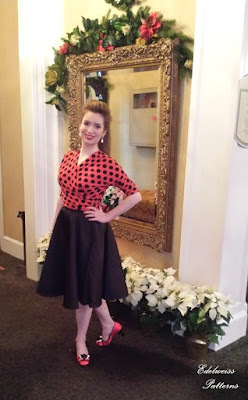 If you think the top outfit she made was great I am in awe of this one and have a new website to follow! 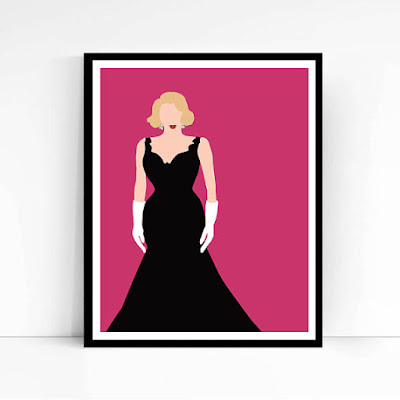 Lord this is stunning! Click here to see this post she did! It is a season of memories. As many of you know by now I am moving in a few short days and leaving an area I have called home since 1977. Though I am not moving that far, it does feel like a world away. 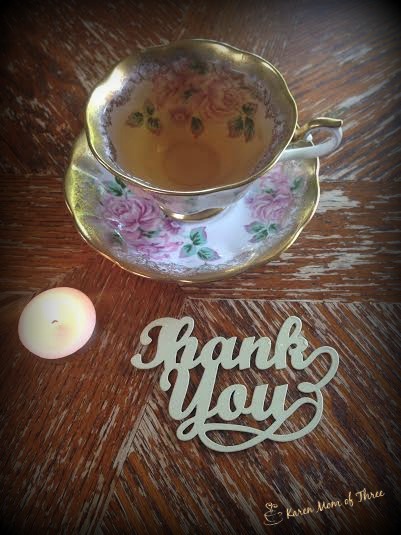 I have the most amazing neighbors, friends and family here who have made up many of the most happy memories I have. I have talented neighbors too. I came home after a long walk in the snow Sunday to find a wrapped gift at my door. Author Lorraine McNeight is a neighbor of mine. 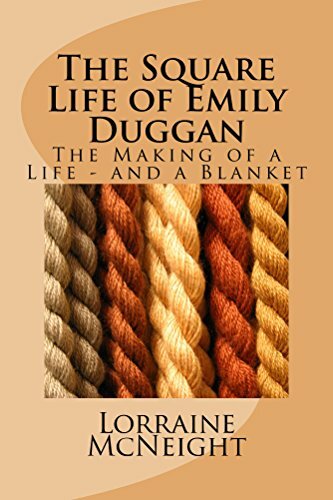 Her new book The Square Life Of Emily Duggan is an incredibly touching book. What a gift this story was to read on this very snowy Sunday. This is a very moving story about life in all its glory, triumphs and turbulence. Beautifully written and spanning generations, knit beautifully together in such a lovely way. The story of Emily Duggan begins at a very young age and spans all the important and poignant parts of life. This was so very easy to picture, each character, and setting. From her parents, to the farm, her brothers, sisters, friends. I loved that Lorraine touched on the important and unexpected people who come into your life at times when you need them the most, and who when they leave impressions on your heart but do so without much pomp and circumstance. Quietly and often in the most painful ways, leaving only memories to fill the void. Written with compassion and care this novel is a wonderful read. Emily Duggan leads a simple life, filled with family and friends. 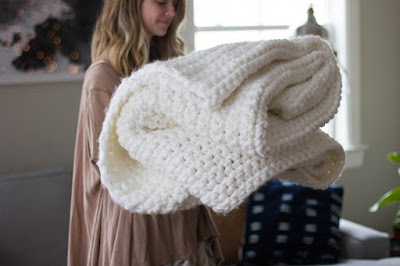 All of her memories are knitted into a blanket, which comforts her in times of tragedy, and keeps her warm as needed. This story reflects an ordinary life, nevertheless lived to the full. 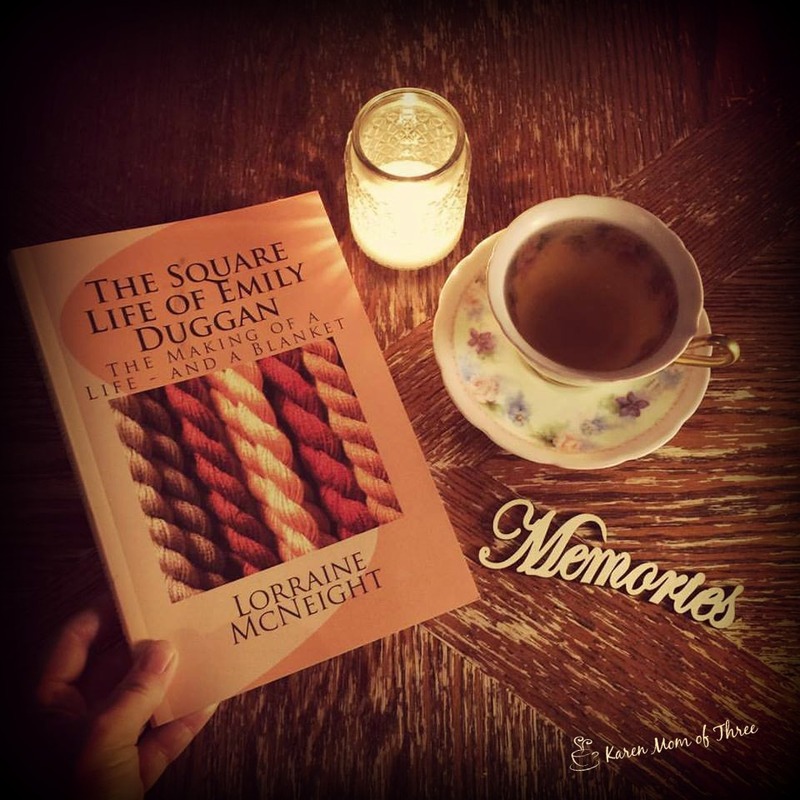 You can find The Square life of Emily Duggan by Lorraine McNeight on Amazon by clicking here. 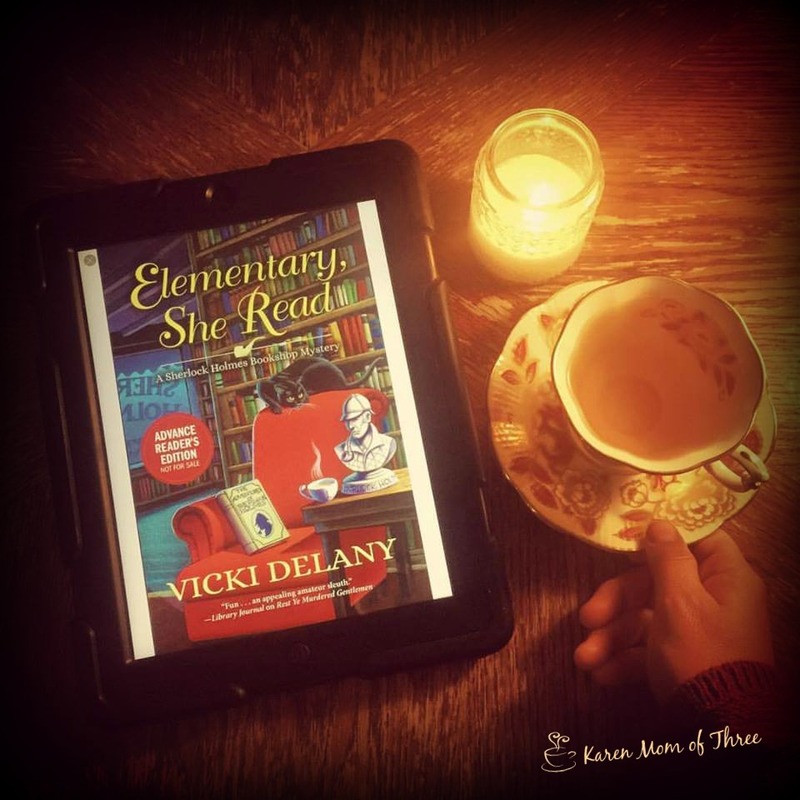 Saturday night I read Elementary She Read by Vicki Delany. Fantastic title and cover don't you think? This is a new cozy series for Vicki that comes out in March from Crooked Lane Books. I thought it was superb! There is so much to love in this book, main character Gemma and her best friend Jayne make a great team. I would love to have Gemma keen sense of observation, house and shop in Boston's cape cod area, along with a mysterious traveling uncle. This was fun, it was fast and it was thought provoking. 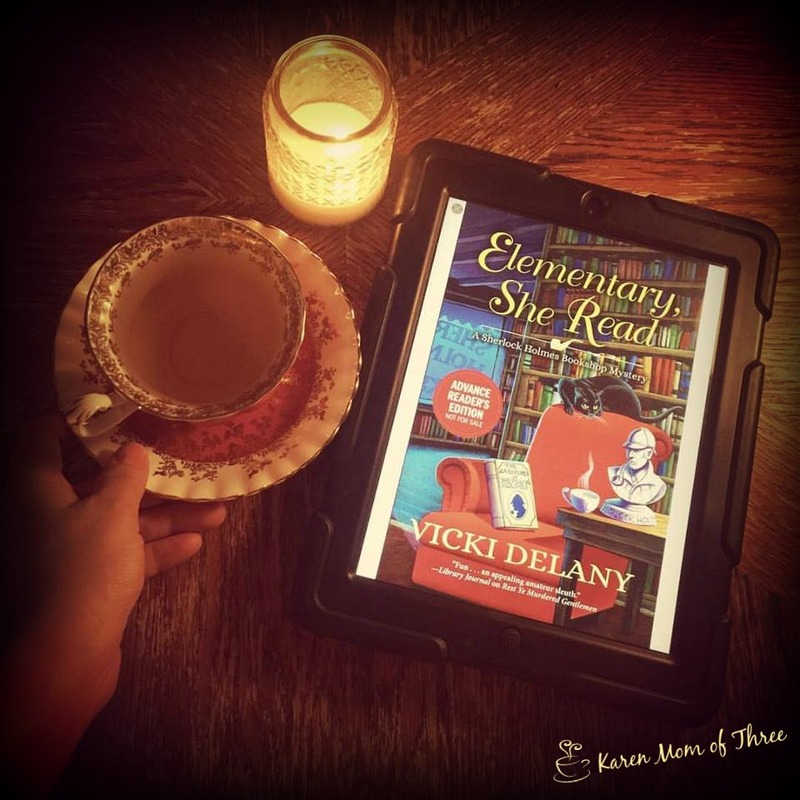 Vicki is a great author, chose a great cozy setting as well as a fun way to show a love of Sherlock! I think this will be a very popular series, do keep it in mind for your Spring break read! 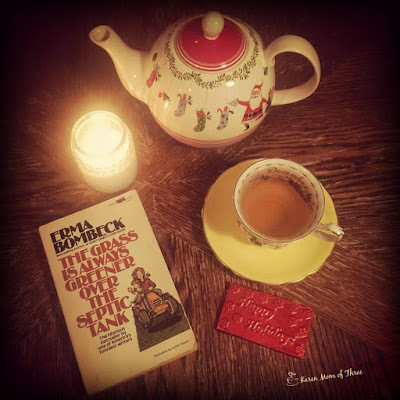 Gemma Doyle, a transplanted Englishwoman, has returned to the quaint town of West London on Cape Cod to manage her Great Uncle Arthur's Sherlock Holmes Bookshop and Emporium. The shop--located at 222 Baker Street--specializes in the Holmes canon and pastiche, and is also the home of Moriarty the cat. 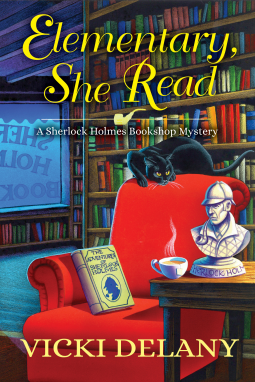 When Gemma finds a rare and potentially valuable magazine containing the first Sherlock Homes story hidden in the bookshop, she and her friend Jayne (who runs the adjoining Mrs. Hudson's Tea Room) set off to find the owner, only to stumble upon a dead body. The highly perceptive Gemma is the police’s first suspect, so she puts her consummate powers of deduction to work to clear her name, investigating a handsome rare books expert, the dead woman's suspiciously unmoved son, and a whole family of greedy characters desperate to cash in on their inheritance. But when Gemma and Jayne accidentally place themselves at a second murder scene, it's a race to uncover the truth before the detectives lock them up for good. To learn more about Vicki Delany please click here. I have been blessed this week with great reads and great friends. 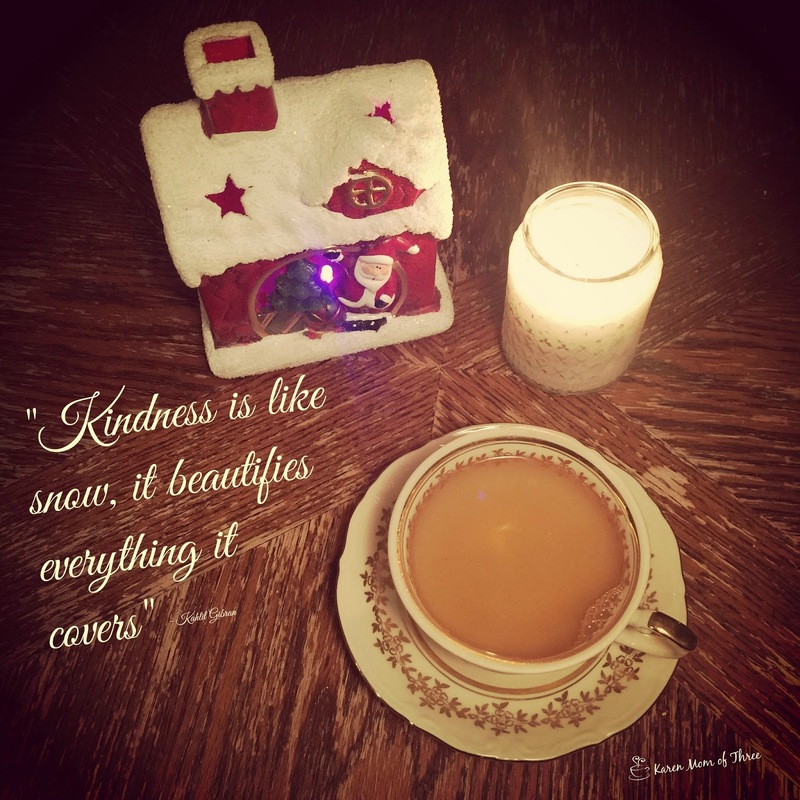 On my table and in my life, kindness has surrounded me. Yesterday I was surprised by some amazing ladies with holiday gifts that were absolute surprises and delightful ones at that. Saffron tea from Iran, a beautiful friendship teaspoon, handmade coasters, chocolates and a bath balm treat I am so looking forward to using. I have had fantastic books to read this week. 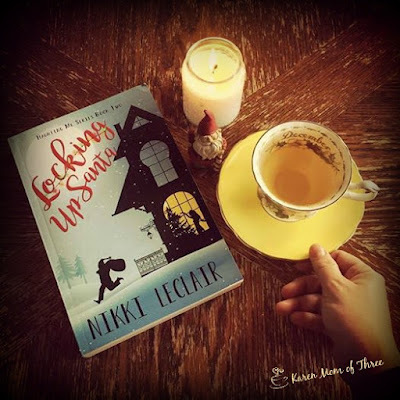 I was thrilled when my copy of Locking Up Santa arrived from Nikki LeClair! Fantastic holiday read and out now! 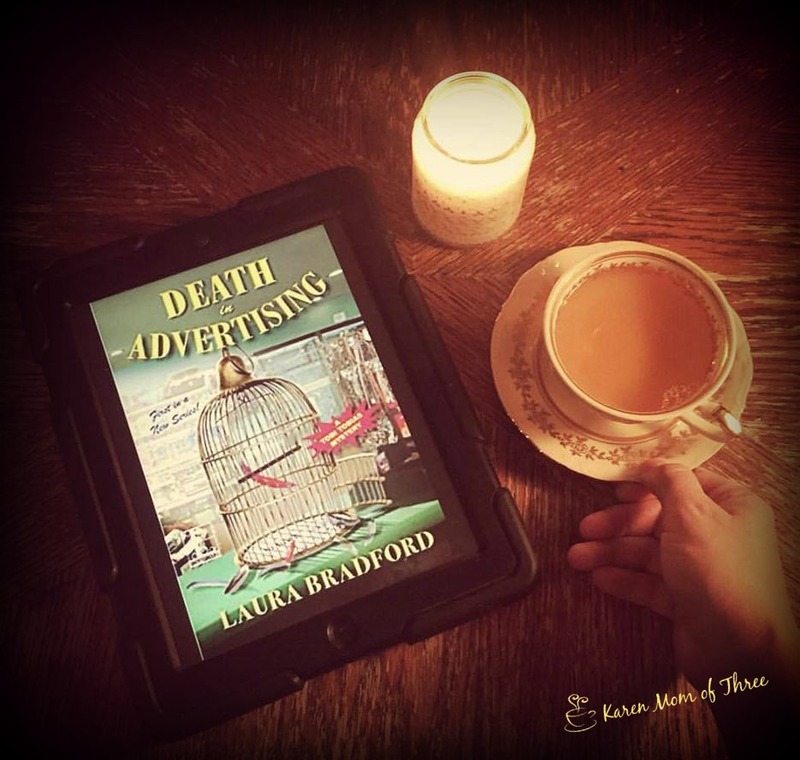 Laura Bradford's February release Death In Advertising was a great first in series and a cast of characters I loved, I hope you will too. Mark your calender's for this release! Not normally one in my mind for historical books but this book had me looking at historical cozies in a whole new way. Funny, exciting and completely cozy this Mail Order Bride mystery by J.v.L Bell was completely fun. 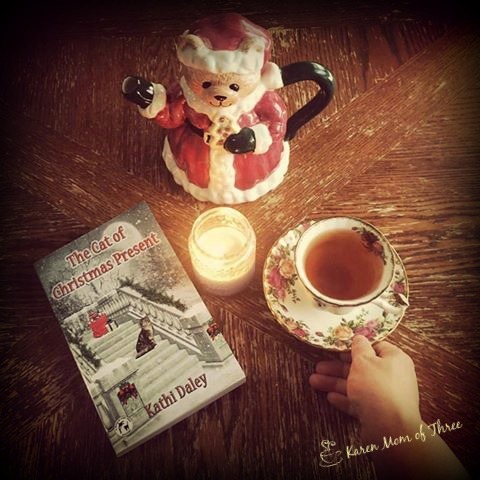 Kathi Daley and her Whales and Tails Mystery The Cat of Christmas Present was so good I was balling at the end. 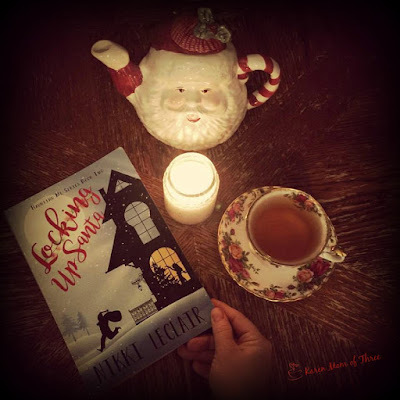 Heartwarming, story of overcoming adversity, family and a little holiday magic made this a great read, out now and worth downloading to your kindle app, grabbing a blanket and a pot of tea and escaping for the day. 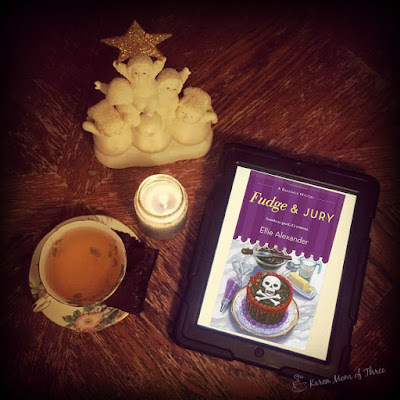 Fudge & Jury by Ellie Alexander a delightful and delectable series, fun, foodie themed mystery and the best mother/daughter relationship going! Be sure to order this one as well! Friday I had Erma Bombeck on my table, one of my favorites. A great lady who wrote about life in away only a mother could truly appreciate, relate too and rejoice in. Even now more then 40 years after this book was published I found myself laughing and crying. Not a mystery, or a how too book but a cozy feeling read for sure. Last night I finished Locking Up Santa, book two in the Haunting My Series by Nikki LeClair. This is a paranormal cozy series, but it doesn't read like one. It is really not what I would have expected from a paranormal cozy, it is way better! I love the relationship between Phoebe the main character and her ghostly partner who happens to be a recently deceased CEO of a Beauty Company that Phoebe now runs. Eddie and Phoebe work well together and have really grown in book two. I enjoyed this mystery, it was a juicy one, it had me guessing until the end and my head spinning with the way the big reveal unraveled. 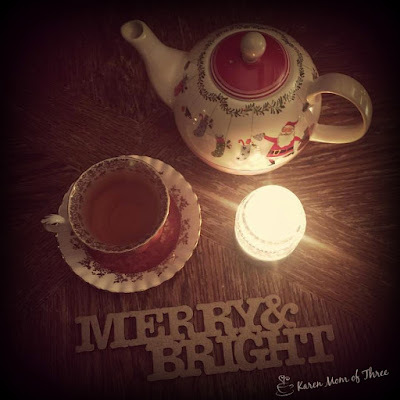 I enjoyed this Christmas themed cozy and think you will too. Fun series, great writing, characters and I can not wait to see what happens next. I also absolutely love this cover don't you? It’s the Christmas season, and seven months since Phoebe Mercer’s life dramatically changed. She went from being an overworked legal assistant to a CEO of Lavish Looks Beauty Company. She moved from the bustling city to a quaint seaside town. She’s gone from living with a fiancé to living with a ghost. Yet, it seems she can’t get a grip on her new life, whether it’s getting used to being a public figure, having a Chief Operating Official who hates her, or a ghost who is just too passionate. As if things couldn’t get any worse, Phoebe’s mentor is suddenly arrested for a horrible crime and the town is ready to lock them away for good. The new product from Lavish Looks smells like a sewer, and people everywhere are noticing. Phoebe and her ghost find themselves having to race against time to prove her mentors innocence, and stop the company from sinking. Meanwhile, Phoebe must deal with a face from her past that throws her in a disarray of emotion, an unwanted visitor, and old friends who seem to have abandoned her. Can she figure out whose sabotaging her life, and the company, before she finds herself behind bars for a crime she didn't commit? 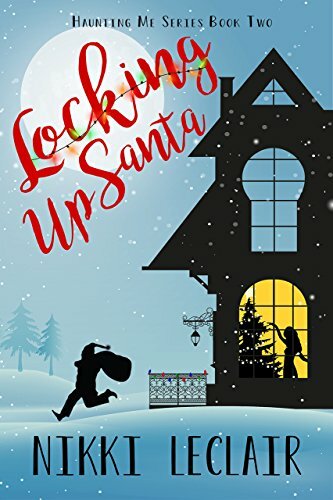 Order your own copy of Locking Up Santa, out now on Amazon by clicking here. Learn more about author Nikki LeClair on her Facebook page by clicking here. What a treat to read Laura Bradford's new first in series, February 7th's release called Death in Advertising. Laura is a wonderful author, and this is a great series idea. I loved the quirky main character Tobi Tobias. She is a coco puff cereal loving, Mcdonald's eating, slightly down on her luck completely relate able character. 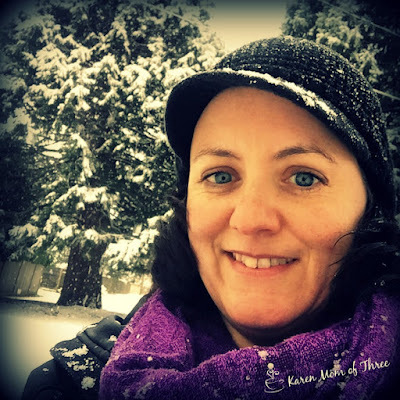 Creative, kind, and learning to make her way on her own in business. She is not only relate-able she is inspiring. Great cast of supporting characters especially her Grandfather and young photographer friend. I really enjoyed this story, mystery and getting to know Tobi and the crew. I look forward to more books in this series for sure. Sometimes when opportunity knocks, the door you open leads to a closet. That’s certainly the case for Tobi, whose weekends spent cleaning cages in her best friend’s pet shop may soon be over. She’s just landed her first big break—Zander Closet Company needs a catchy campaign slogan ASAP, and Tobi thinks she’s got the right hook to knock ’em dead: “When we’re done, even your skeletons will have a place.” But when a real dead body topples out of a showcase closet, she’s about to discover there is such a thing as bad publicity. To save her fledgling business and not get killed by the competition, Tobi takes on a new pet project: solving the murder. 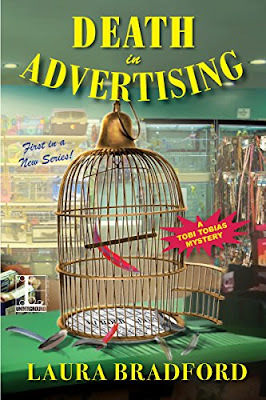 But with a stressed-out parrot as the only witness to the crime, Tobi will really have to wing it to put the cagey killer behind bars. 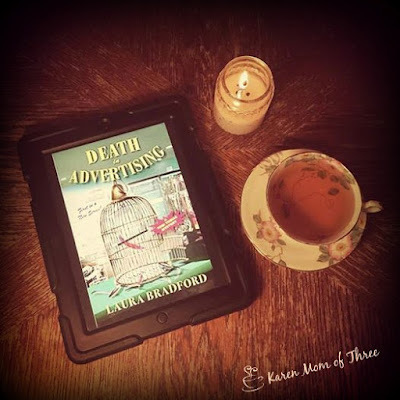 To pre order your own copy of Death in Advertising from Amazon please click here. Learn more about Laura Bradford by clicking here for her website. 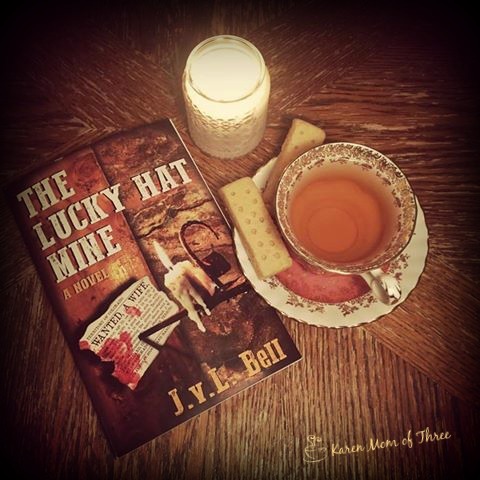 Yesterday I finished The Lucky Hat Mine a very cozy novel by J.v.L Bell. I found this book was extraordinary! I sat down and read the first 34 chapters and when my husband told me it was an hour past my normal turn in time I was shocked. I woke up and finished the book completely delighted. 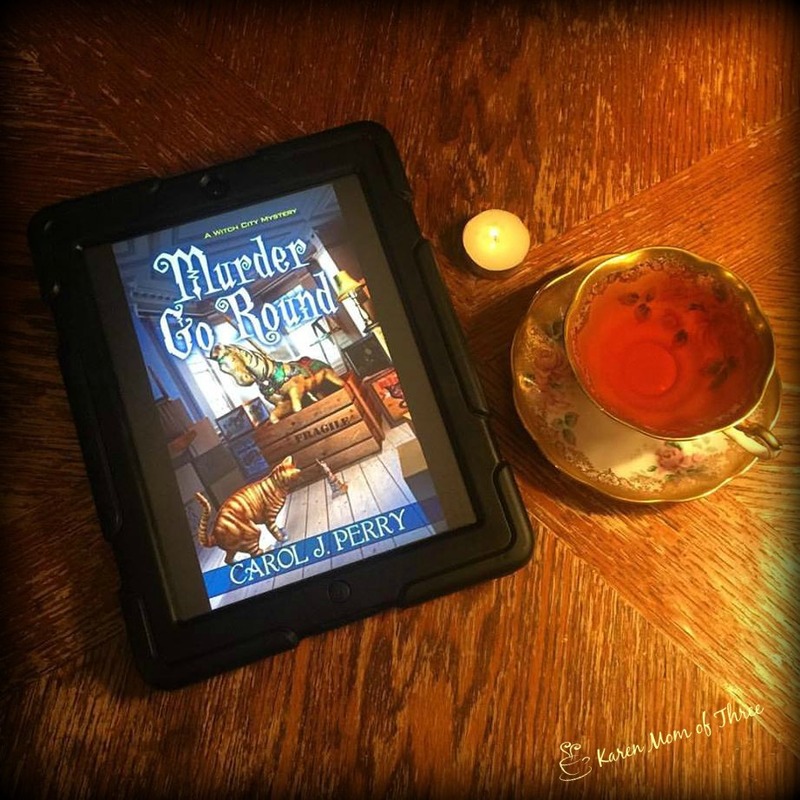 I am not usually one to pick cozy mysteries that are set in the past, however I really enjoyed this story, the mystery and the romance. I also really appreciated the sarcasm, wit and they way that main character Millie was written. This novel had everything I love in modern day cozy mysteries but it had so much more. It was carefully thought out, researched and the characters were extremely well developed. True to a cozy the animal companion in this story adds a special charm and endearment. 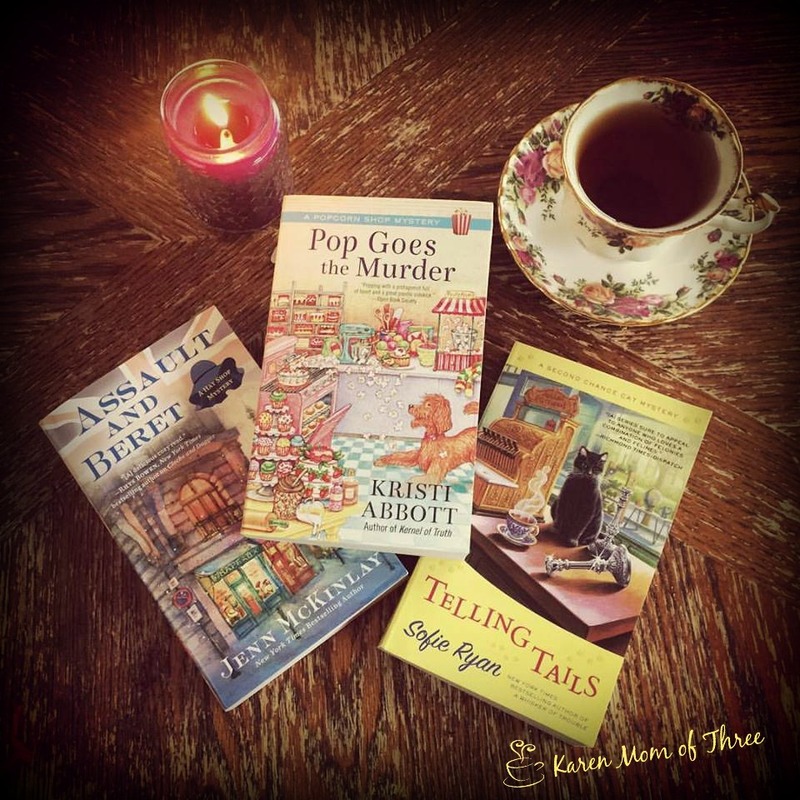 I was delighted to read this historical cozy mystery and I think you would love it too. 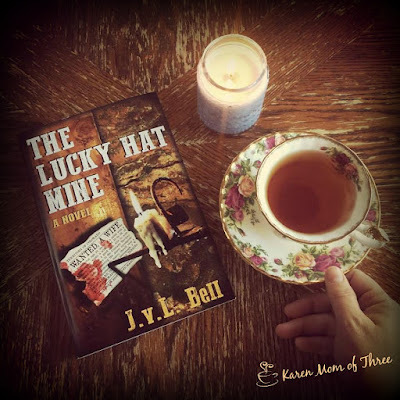 Mail order Southern Bride, gold rush mining/frontier town, an unusual arrangement and best friend, mystery and romance await you in The Lucky Hat Mine. 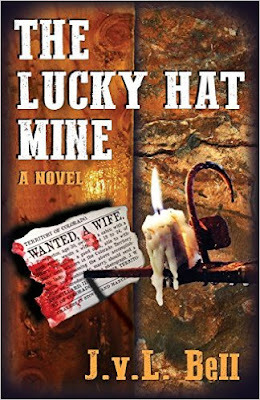 To order you own copy of The Lucky Hat Mine bby J.v.L. Bell from Amazon please click here. Learn more abut J.v.L Bell and her writing by clicking here for her website.